Painting of Hagar in the wilderness by Giovanni Lanfranco. It hangs in the Musée du Louvre. Hagar was the Egyptian handmaiden to Sarah, Abraham’s sister wife. She was also one of Abraham’s concubines. Though she is presented as a downtrodden slave, it is likely that Hagar was highly cultured and moved comfortably in the circle of nobles. 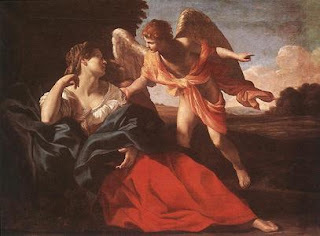 As the Horite Hebrew clans practiced endogamy, it is likely that Hagar was the daughter of a Horite Hebrew priest, and as such, she would have been a skilled attendant to Sarah, and even as a concubine, she would have been a woman of high social status. Sarah’s resentment toward Hagar appears to have had a long history. Some of the resentment may have been cultural. Sarah was from the region of Aram in Mesopotamia while Hagar is identified as an Egyptian. Sarah's resentment toward Hagar became blind jealousy after Isaac was weaned, when Ishmael was about 15 years old. Genesis portrays Hagar as having a complex personality. In later life she is a strong and independent woman, contracting marriage for her son and apparently producing other offspring known as the Hagarites. They are mentioned in Psalm 83:6. The core of this psalm is believed to pre-date David. The Hagarites are distinct from the Ishmaelites in the Psalm 83 listing of allies, so it is apparent that Hagar (like Anah and Oholibamah) was regarded as a clan chief. This picture of Hagar as a mature clan chief differs from the picture presented in Genesis 16:5 where we are told that Hagar acted tactlessly toward her childless mistress. Sarah blamed Abraham for this and Abraham said to Sarah: “Your slave-girl is at your disposal. Treat her as you think fit” (Genesis 16:6). Sarah then abused Hagar who fled to a spring where Abraham had lived for a time (Genesis 20:1). The Angel of the Lord found her at the spring and prophesied concerning her son that his name should be Ishmael meaning God Hearkens, for God heard the cry of Hagar's affliction. This story portrays Hagar as a tactless, abused runaway, but note how she has a personal encounter with the Lord at the water shrine! She knows that she has encountered the all-Seeing God because she declares that she has gone on seeing, even as she is seen (Genesis 16:14). The Angel of the Lord speaks in the first-person, and in verse 13 Hagar identifies the visitor as God. To me, this sounds like a conversion story. Given the times in which Hagar lived, she would have run to a place where she felt she could provide for her son. She traveled to a shrine half way between Kadesh and Bered (Genesis 16:14). In Genesis, when a water system is identified as being along a road between two towns, it is a shrine to which a priest is attached. It is likely that Hagar had family there. Since this was Horite Hebrew territory, an Egyptian priest (Harwa) at a water shrine would have been a Horite priest. Horite territory extended north-south at least between Mount Hor (above Kadesh-barnea) and Mt. Harun or Hor south of Oboth. 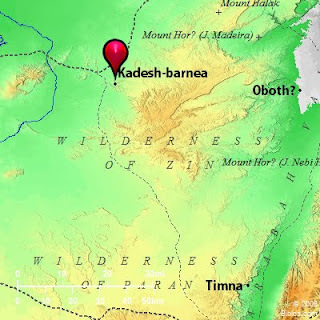 According to Genesis 14: 6, Horite territory extended as far south as the wilderness of Paran (see map). A temple dedicated to Hathor, the mother of Horus was discovered at the southwestern edge of Mt. Timna by Professor Beno Rothenberg of Hebrew University. This is the site of some of the world's oldest copper mines. 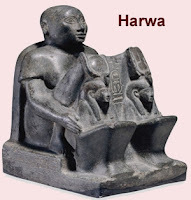 Horite priests were devotees of Horus, who was called “Son of God.” From ancient Egyptian texts we gather that Horus is equal to the Father in nature and glory. The Ancient Egyptian Coffin Texts and Pyramid Texts provide a great deal of information about Horus, the divine son of Ra. This is expressed in the Ancient Egyptian Pyramid Texts. In the priest's prayer to the King, he says, "Horus is a soul and he recognizes his Father in you..." (Utterance 423). In these texts Horus is described as the one who unites the peoples (the Upper and Lower Nile). This is symbolized by the double crown. The rulers of the two regions wore different crowns, but Horus was called "Horus of the Two Crowns" because he wore both. This is what stands behind the account of Yeshua/Joshua, the priest, receiving the "crowns" in Zechariah 6:11: "Take the silver and gold, and make crowns, and set it upon the head of Joshua the son of Jehozadak, the high priest..."
I am Horus, the great Falcon upon the ramparts of the house of him of the hidden name. My flight has reached the horizon. I have passed by the gods of Nut. I have gone further than the gods of old. Even the most ancient bird could not equal my very first flight. I have removed my place beyond the powers of Set, the foe of my father Osiris. No other god could do what I have done. I have brought the ways of eternity to the twilight of the morning. I am unique in my flight. My wrath will be turned against the enemy of my father Osiris and I will put him beneath my feet in my name of ‘Red Cloak’. This text is about 1000 years older than the words of Psalm 110:1, a clear messianic reference: The Lord says to my Lord: “Sit at My right hand until I make your enemies a footstool for your feet." "Horus has shattered (tbb, crushed) the mouth of the serpent with the sole of his foot (tbw)" Utterance 388 (681). This reference dates to about 800 years before Psalm 91: ""They will bear you up in their hands, That you do not strike your foot against a stone. You will tread upon the lion and cobra, The young lion and the serpent you will trample down." Horus gives himself as mystic food of immortality. In The Pyramid Texts, dating from the beginning of the 4th Dynasty, we read: "O Hunger, do not come for me; go to the Abyss, depart to the flood! I am satisfied, I am not hungry because of this kmhw-bread of Horus which I have eaten." (Utterance 338) The Egyptian word km means to bring to an end, to complete, or fulfill, and hw refers to the heavenly temple or mansion of the firmament above. It appears that the "kmhw-bread of Horus" is what the Church Fathers call "the bread of immortality." Concerning himself, Jesus said that "unless you eat the flesh of the Son of Man and drink his blood, you have no life in you. Whoever feeds on my flesh and drinks my blood has eternal life, and I will raise him up on the last day" (John 6:53-54). These are key elements of the Messianic Faith by which Messiah is identified. Jesus Messiah is sometimes called “the Angel of the Lord.” Perhaps he met Hagar’s when she fled to the Horite shrine. Might Hagar's conversion be due to a personal encounter with the pre-incarnate Christ? This is how some Church Fathers see Hagar's visitation. He who is of one essence with the Father, “for in Him dwelleth all the fullness of the Godhead bodily” (Col. 2:9) came into the world to save sinners like Hagar... like me.